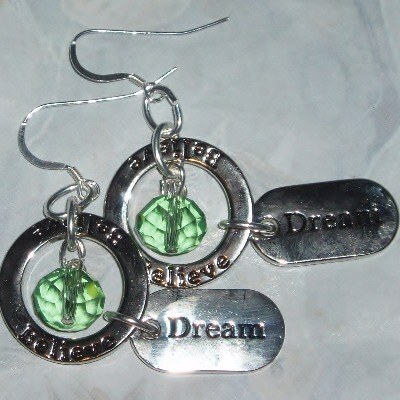 Dream Believe Affirmation Birthstone Earrings. Charming Dream Believe Birthstone Affirmation earrings with 25mm Believe charm rings and 23mm Dream charm tags, enhanced with 8mm Birthstone coloured faceted glass crystal rondelles sparkling in the centre. These earrings have sterling silver wires and the charms are shiny silver plated. They measure 45mm from top of Believe ring to bottom of Dream tag. Perfect match for the Dream Believe Affirmation Birthstone pendant.